Carburizing is one of the most widely used surface hardening processes. It has been in use for a long time. The process involves diffusing carbon into a low carbon steel to form a high carbon steel surface. Carburizing process is also referred to as case hardening or case carburizing process. It is a heat treatment process that produces a surface which is resistant to wear, while maintaining toughness and strength of the core. The carburizing process has evolved with advancements in heat treatment techniques that have improved the hardness and durability of products like carbon steel wire springs and carbon steel forgings. Carburizing is a heat treatment process in which steel absorbs carbon liberated when the steel is heated between 850 deg C to 950 deg C in the presence of a carbon bearing material, such as charcoal or carbon monoxide, with the intent of making the steel harder. The heated steel at this temperature has austenitic structure which has got high solubility for carbon and which is a stable structure. Depending on the amount of time and temperature, the affected area can vary in carbon content. Longer carburizing times and higher temperatures typically increase the depth of carbon diffusion. When the steel is cooled rapidly by quenching, the higher carbon content on the outer surface becomes hard via the transformation from austenite to martensite while the core remains soft and tough as a ferritic and/or pearlitic microstructure. 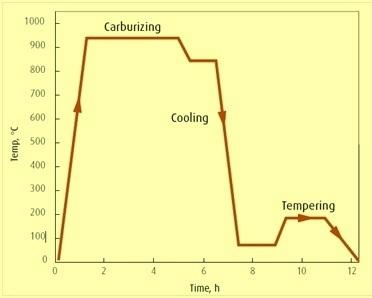 The typical carburizing process cycle including the quenching and tempering steps is shown in Fig 1. Carburized steel consists of a composite material, where the carburized surface is hard but the unaffected core is softer and ductile. Compressive residual stresses are formed in the surface layer upon quenching from the carburizing temperature. 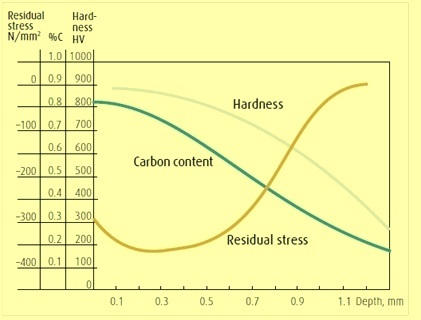 The combination of high hardness and compressive stresses results in high fatigue strength, wear resistance and toughness as shown in Fig 2. Carburizing increases strength and wear resistance by diffusing carbon into the surface of the steel creating a case while retaining a substantially lesser hardness in the core. This treatment is applied to low carbon steel parts after machining, as well as high alloy steel bearings, gears, and other components. The carburizing process is characterized by the following key points. It produces case hardened depths of up to 6 mm. In some cases it serves as a remedy for undesired decarburization which has happened earlier in a manufacturing process. The carbon content of the case and its depth is controlled by the carburizing time and temperature. Case depth of carburized steel is a function of carburizing time and the available carbon potential at the surface. When prolonged carburizing times are used for deep case depths, a high carbon potential produces a high surface-carbon content, which may thus result in excessive retained austenite or free carbides. These two microstructural elements both have adverse effects on the distribution of residual stress in the case-hardened part. Consequently, a high carbon potential may be suitable for short carburizing times but not for prolonged carburizing. A carburizing atmosphere must be able to transfer carbon to the steel to provide the required surface hardness. To meet hardness tolerance requirements, this transfer must result in closely controlled carbon concentrations in the steel surface. The carbon concentration can be controlled by the ratio (vol. % CO)²/(vol. % CO2) in the furnace atmosphere. While the fundamental carburizing principle has not changed much since its inception, the carbon introduction techniques have been improving. The following are the carburizing processes commonly used by the industry. Pack carburizing – In this process low carbon steel components are packed in an environment with high carbon content such as cast iron shavings or carbon powder. The components are heated with the production of carbon monoxide, which is a reducing agent. The reduction occurs on the steel surface with the release of carbon that is diffused into the surface because of high temperatures. With the carbon absorption inside the component, the steel components are hardened. The surface carbon is in the range of 0.7 % to 1.3 % depending on the process environment. The case depth is approximately 0.1 mm to 1.5 mm. Control of pack carburizing is difficult because it is difficult to maintain uniform temperatures. Pack carburizing is effective in introducing carbon but this method is exceedingly slow. Gas carburizing – In gas carburizing, the parts are surrounded by a carbon bearing atmosphere that can be continuously replenished so that a high carbon potential can be maintained. While the rate of carburizing is substantially increased in the gaseous atmosphere, the method requires the use of a multi component atmosphere whose composition must be very closely controlled to avoid deleterious side effects, for example, surface and grain-boundary oxides. In addition, a separate piece of equipment is required to generate the atmosphere and control its composition. The gas carburizing process is theoretically similar to pack carburizing process aside from the supply of carbon monoxide (CO) gas to the heated furnace and the carbon decomposition. Many of the problems with pack carburizing are eliminated in this process. The CO gas needs to be contained safely. Despite this increased complexity, gas carburizing has become the most effective and widely used method for carburizing steel parts in large quantities. Liquid carburizing – In this process the steel components are submerged in a liquefied carbon rich environment. The main component in such baths is cyanide. However, safety issues have led to baths that are non-toxic that accomplish similar results. The components are held in a molten salt that introduces carbon into the steel. Carbon is diffused inwards producing a hardened case by rapid quenching. The case produced by carbon diffusion is similar to that produced by gas carburizing. Cases formed by liquid carburizing have low nitrogen and high carbon content. Vacuum carburizing – The vacuum carburizing process involves carburizing in a low pressure environment which is free from oxygen. The atmosphere is significantly simplified although the furnace enclosure is more complex. A single component environment containing uncomplicated gaseous hydrocarbon like methane is used. Since the environment used for heating is oxygen free, the carburizing temperatures can be considerably increased without surface or grain boundary oxidation. The higher temperatures increase the carbon solubility and the diffusion rate. Thus, the time necessary for case depth is reduced. Although vacuum carburizing overcomes some of the complexities of gas carburizing, it introduces a serious new problem that must be addressed. Because vacuum carburizing is conducted at very low pressures, and the rate of flow of the carburizing gas into the furnace is very low, the carbon potential of the gas in deep recesses and blind holes is quickly depleted. Unless this gas is replenished, a great non uniformity in case depth over the surface of the part is likely to occur. If, in an effort to overcome this problem, the gas pressure is increased significantly, another problem arises, that of free-carbon formation, or sooting. Thus, in order to obtain cases of reasonably uniform depth over a part of complex shape, the gas pressure must be increased periodically to replenish the depleted atmosphere in recesses and then reduced again to the operating pressure. Clearly, a delicate balance exists in vacuum carburizing: The process conditions must be adjusted to obtain the best compromise between case uniformity, risk of sooting, and carburizing rate. Plasma carburization – In plasma carburization method, plasma impinges positive carbon ions on the surface of a steel part (the cathode). The main difference between conventional and plasma carburization is the reduced carburizing times achieved in plasma methods. The quickly attained surface saturation also results in faster diffusion kinetics. Furthermore, plasma carburizing produces very uniform case depths, even in parts with irregular surfaces. Plasma carburization is increasingly being used in major industrial establishments to improve the surface characteristics (such as wear and corrosion resistance, hardness and load bearing capacity, in addition to quality based variables) of various steels, especially stainless steels. The process is used as it is environmentally friendly (in comparison to gaseous or solid carburizing). It also provides an even treatment of components with complex geometry (the plasma can penetrate into holes and tight gaps), making it very flexible in terms of component treatment. Plasma carburizing has found applications because of the absence of oxygen in the furnace atmosphere. Carburizing steels normally have base carbon contents of around 0.2 %, with the carbon content of the carburized layer generally being controlled in the range of 0.8 % to 1 %. However, surface carbon is often limited to 0.9 % because too high a carbon content can result in retained austenite and brittle martensite. Most steels that are carburized are killed steels (deoxidized by the addition of aluminum), which maintain fine grain sizes to temperatures of around 1040 deg C. Steels having coarse grains can be carburized if a double quench provides grain refinement. Double quenching usually consists of a direct quench and then a re-quench from a lower temperature. When selecting the steel type, the first requirement is that the alloy and carbon concentration meet the requirements for the resulting core hardness after austenitizing, quenching and tempering. For specific core hardness requirements this means that, as the dimensions of the treated parts increase, the required alloy content will also increase. The hardenability of a case hardening steels must be sufficiently good to result in a martensitic surface case to the required depth. Case hardening steels must therefore contain a certain amount of alloying elements. A further requirement is that steels for carburizing should be fine grain treated. This means that the steel should contain an alloying element, usually aluminum that creates the precipitates. These precipitates act as a barrier to grain growth up to a certain maximum temperature, typically about 950 deg C.
Many alloy steels for case hardening are now specified on the basis of core hardenability. Although the same considerations generally apply to the selection of uncarburized grades, there are some peculiarities in carburizing applications. First, in a case hardened steel, the hardenability of both case and core must be considered. Because of the difference in carbon content, case and core have quite different hardenabilities, and this difference is much greater for some steels than for others. Moreover, the two regions have different in-service functions to perform. Until the introduction of lean alloy steels, with and without boron, there was little need to be concerned about case hardenability because the alloy content combined with the high carbon content always provided adequate hardenability. This is still generally true when the steels are direct quenched from carburizing, so that the carbon and alloying elements are in solution in the case austenite. In parts that are reheated for hardening and in heavy sectioned parts, however, both case and core hardenability requirements should be carefully evaluated. The relationship between the thermal gradient and the carbon gradient during quenching of a carburized part can make a measurable difference in the case depth as measured by hardness. That is, an increase in base hardenability can produce a higher proportion of martensite for a given carbon level, yielding an increased measured case depth. Therefore, a shallower carbon profile and shorter carburizing time could be used to attain the desired result in properly chosen steel.